In large skillet, over low heat, add butter. Once butter melted, add apple pie filling, cinnamon, ground ginger and light brown sugar. Stir occasionally. Remove biscuits from can, lightly flour biscuits and roll each one out to 5 inch rounds. Spoon 1 heaping tablespoon apple pie filling on each round. Fold each round over pie filling, making half moon shapes. To seal, flour fork and pressing around the edges with the tines of a fork. Using a fork prick each pie to vent. Preheat oven to 350 degrees. Spray sheet pan with nonstick cooking spray. Back 18 to 20 minutes, until golden. Enjoy! Those are cute, Christine. If I just saw them sitting there, I would have thought they are meat pies. Great idea! Delicious looking Christine! What a quick easy dessert! Now to go look and see if I have any biscuits in the fridge hehehe. Wow, these look so easy and so tasty! 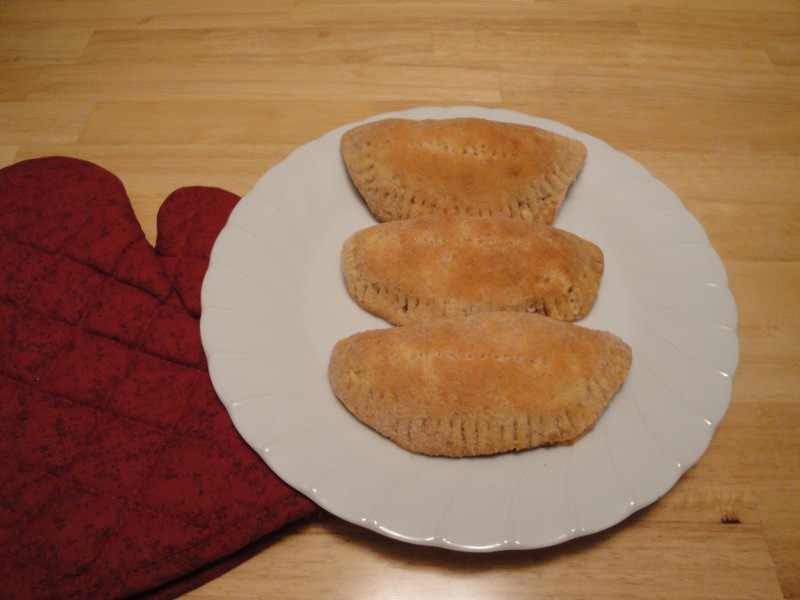 Instant apple pies, I love it! Thanks for the apple history, I always look forward to these food history lessons! That's sounds delicious, I am still to make pies so thanks for the share. I love miniature desserts Very cute! and interesting background info an apple pies. These look awesome one of my favorite coffee and dessert treats! These are really cute Christine! How cute are those? Love it, Christine. I love little apple pies like this! They're so cute and yummy! Great recipe, Christine! These are so cute! I love the idea of using biscuit dough to make these. These are adorable! I bet they are oh-so-yummy. How neat to use buttermilk biscuits. Nothing like a time saver! I can't get enough of apple pies, I just love it. I'll probably go for more with your mini apple pies! Pie town New Mexico does sound like a delicious place to live. Glad I do not have to go there to have a great tasting pie. Your recipe has provided me with all I need. Thanks Christine, I can always rely on you for something delicious and easy to make! Keep 'em coming. Thanks y'all for taking time and stopping by. I just love to hear from everyone. Thank you for being a part of Christine's Pantry. As usual, I've learned a great deal about the history of food here on your blog. These little pies remind me of the vegetable-filled or meat-filled patties in the Jamaican restaurants. Do you ever put icing on them? That's my kind of recipe too--easy! Thanks, I'll be surprising my family at Sunday breakfast with these little pies. Yes, I do place icing on them. They are good with or without icing. Super yummy. I'd love to try these out. I love how simple these are--they look like little empanadas! Oooh, I love apple pie...and your mini version looks outstanding! MMmm!! I'd make these, then eat them out myself!! lol. They sound great! Great idea to use biscuits to make these Christine! You can use a gluten free bisquick mix as substitute. "No pie-eating people can be permanenetly vanished" should be on a tee shirt...another American marketing platform. I enjoy the history tidbits you write about. Thanks! Apple pie is my favorite fruit pie! These are so incredibly cute, and I love that you can hold the pie in your hand and eat it without making too much of a mess ;)! How cool that you used biscuits for the crust! What a perfect way to get your pie fix without having to make a whole pie or a pie crust! So cute.